So what was the Conservative party’s belief system in the inter-war era? Before giving my view I want to emphasise that this is even more provisional than the rest of my posts in this series... Moreover this task is particularly less than the Labour party of the era was the ideology of the party based on some set text or Canon.-it has to be inferred from the views and statements of supporters, members and leaders-which is not to say it was not real. If Labour was defined by cooperation and equality both economically and internationally at the core of Conservatism was the conservation of major institutions. These intuitions could be summarised as the fundamental institutions of the UK state and to some degree society, including Monarchy, the House of Lords, the established churches ( Church of Scotland as well as England), empire, the union and its independence , the army , the major trades including the drink one , the pound and private property (in a sense the earlier institutions could be seen as public property) and civil order. This held together diehards such as Gretton or arch moderates such as Lord Halifax. -It is no coincidence that it was in this era that the generic term Conservative clearly elbowed aside the more constitutional and generic “Unionist” as the usual Monique for the UK’s biggest right of centre partisan force -even though the change in ideology in this period was not that extensive. On domestic policy private property was the most relevant important of Conservative party values much more so than it had been before World War I when it had already been increasingly important.- Indeed the formation of the Conservative dominance in this period can be seen as the rallying of electoral forces behind the defence of property. This was because of the clashes of it (as opposed to say Gladstonian liberalism) with Labour whose different forms of Collectivism were clearly incompatible with a high view of the defence of private property. For example the desire for raising taxes to fund redistribution attacked private property, to nationalise large industries, a web of regulations (insert Baldwin quote) controlling the activity of industry all were treated with deep scepticism by Conservatives. With trade unions the story was more complicated though those privileges of unions which hit hardest against property (for example the ability to break contract without being sued) were the most resented. The General Strike added to this terror of civic disorder and (grossly exaggerated) fear of revolution – it’s no coincidence it was followed by the most significant attempt to restrict union power by the party Conservative government in this period. In a sense unions won some sympathy from Conservatives as a major intuition-it was when these rights clashed with those of other institutions notably the rights of private property that Conservatives-the supposed “anti-competitive” nature of unions that so aroused the indignation of Hatcheries was not a central preoccupation of the interwar Conservative party. The main legislative form this took was the Trade Union disputes act of 1927 which was aimed at keeping the effect of trade unions on other instititution's at bay- by restricting sympathy strikes, mass picketing, civil service unions, general strikes and donations to the Labour party ( a partisan move). Such aspects as legal immunity and lack of organisational regulation were not touched by the interwar Conservatives-which helped reflect their labour ideology Nonetheless this still represented a sharp contrast with the attitude of the aptly and deliberately named Labour party. The belief the currency and the fiscal rectitude of the nation was also reflected in a firm support for balanced budgets and stable (even falling prices)- as already mentioned the Labour party was quite sympathetic these principles but they lacked the same overwhelming indeed close to unquestioning support. And the combination with the anti tax stance had huge implications for government spending. IT’s important to realize though that the great mass of the Conservative party did not simply have the opposite priorities to Labour nor did their ideology boil down to what today might be called neo-liberalism or then Gladstonian Liberalism. For example many conservatives were quite sympathetic to welfare extension-though the widespread scepticism on most ways to pay for it had a big implication particularly when times grew tough and they were fond of the contributaory principle- redistibutionary welfare was seen in a more sceptical light. Nationalising industries (even with compensation) was an attack on private property-but the continuation of state owned industries in state hands was not an attack on it in the same way-even it was equally anathema to the free market. This point was of only marginal relevance to interwar era politics but was to be important in the failure of the Conservative party to reverse most of the Atlee nationalisations. ” Much extension of government intervention in industry in this period were driven by a Labour desire to spread planning married to a conservative desire to project and help British business. For example very extensive regulations were passed under Conservative governments for example they tightened hours legislation Indeed in some areas where government intervention might plausibly be seen as defending property and Britain the Tories were actually keener than Labour-this was true for Tariffs and to a limited degree certain forms of agricultural support. The last was also influenced by Conservative nationalism and imperialism-the defence of state and empire. IT’s worth noting one of the most popular terms for Protectionism was “Empire free trade”- the Conservatives beloved in an imperial not a “little England” protectionist block. The Conservatives were very wary of the electoral consequences of Protection with good reason their defeat in 1923 was on an election fought on the trade issue. The second attempt I the 1930’s was rather more successful (partly perhaps because other issues such as “economy” in government spending also loomed large). The Conservatives were fairly cautious on Protection-indeed the 1930's owed a great deal to the bullying of "Empire Free trade candidates" who were very completive against, even beating Conservative Candidates in by-elections in the 1929-1931 Parliament. This caution did not represent much diversity of actual views on trade- Conservatives across the political spectrum were fairly firmly supportive of a break with England’s ancient free trade traditions- a victory for Joseph Chamberlain’s ghost (his son Neville took great pride in introducing Protectionism in the 1930’s). . The free trade exceptions including the likes of Churchill and Salisbury were random eccentrics rather than a proper faction -the equivalent of AV Wedgwood in the Labour party (who hated government regulation). This protectionism was even true of many former liberals or those of Liberal party background whose embrace of Conservatism meant embracing “Empire Free Trade”. The leading liberal Sir John Simon went on to lead that faction of the liberals who stayed “National Liberals” after the reintroduction of tariffs it was his acceptance of Projection that marked the key stage in his and their effective absorption into the Conservative party. Even as late as the 1950’s the young Margaret Roberts (after 1951 Thatcher) who was from a liberal family tradition stoutly defended imperial tariffs. Indeed empire represented a broader commitment of the Conservative party. AS we shall see it also fiercely divide them on the details. But unlike Labour ideological anti-imperialism was a marginal force in the Conservative party –the debates concerned how to preserve the Empire. As the party of imperialism, the military and what one might call “state nationalism” the Conservatives overwhelmingly rejected Pacifism or even radical moves to disarmament). Though many Conservatives were League supporters- for them with very few exceptions it was a League of States not a collective of Nations. This general belief in the utility of force meant that for most of the 1930’s the Conservatives consistently took a harder line on Germany-and were much more supportive of defence expenditure than Labour or the liberals. Neville Chamberlain was attacked by Clement Atlee in 1936 ( for raising defence spending too far "Everything was devoted to piling up the instruments of death." 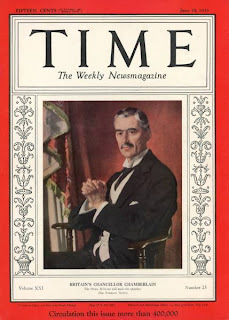 Obviously this did not mean Conservatives were warmonger in any simple or unequivocal way – Neville Chamberlain (The Conservative Prime Minister from 1937 to 1940) willingness to make compromises “appease” in the vernacular of the time Germany is notorious. But the ideology of the Conservative party also shaped these efforts to appease. The reliance on deals between states and military deterrence in Chamberlain’s version of appeasement flowed from Conservative ideology. The Conservative party was also unsurprisingly very hostile to the Soviet Union Indeed After Marxist-Leninism as an ideology was self consciously committed to virtually destruction of all the values the Conservative party stood for from private property to religious faith. It has been argued that this had a big influence on the failure to achieve an alliance with the Soviet Union when they dropped support for appeasement in 1939, an assertion the author like many historians is rather sceptical of. But it was certainly the case that the hardest part of “anti-appeasement” for Tories to swallow was any kind of moves in favour of the Soviet Union. Economics and foreign policy did not of course cover the whole ideology of the Conservative party-and it would be fair to say that was even less true than it was for the Labour party. The old issues whether defence of the established church, the drink trade or the Monarchy still resonated and as we will see in a latter post still had political impact. . There was some dissent on such old issues Nancy Astor the first female Conservative mp (indeed the first female mp) was a fervent prohibitionist which may have helped her win a seat with a powerful liberal tradition. But even before World War I there had been plenty of Tories sympathetic to such policy-including the leader Bonar Law. They remained a minority-more so than in Labour. So we have looked at the broad ideological framework of the two major parties of Inter War Era. Next we shall turn to the Social Cleavages that divided and polarized the public. This is a picture of one of the most significant Conservatives of this era-Neville Chamberlain who was key as Health minister, party chairman, Chancellor of the Exchequer and ultimately Tory leader and Prime Minister. Though in many ways a moderate his protectionism, his commitment to “economy” and his belief in high defence spending and “national deals” all represented a commitment to Conservative ideology. His views were mainstream in the Conservatives they would have been very odd in Labour. It is one of the poignant ironies of his career that his record was to do a great deal to smash the Conservative domains he had done so much to create.